The prices of cars in Vietnam are expected to drop as the doors for imported cars are widely opened while domestically-assembled ones have seen new models as well as new manufacturers. Last year, automobile market was gloomy as the Decree 116/2017/ND-CP relating to conditions for imported car trading caused a sharp decline in the number of imported cars, making customers wait a long time for their cars to be delivered. The situation improved in the second quarter of last year but the number of imported cars was still low and mainly from Thailand as the Ministry of Transport accepted quality certificate issued by Thailand, creating conditions for salons to import the first cars into Vietnam. During this time, only financially healthy customers were willing to pay an extra amount of money to own a car immediately. However, the time has changed. Since the lunar New Year, due to excessive car supply, most automobile salons have started to run several promotional campaigns to boost demand. Especially, up to now, problems relating to the Decree 116 have been resolved so automobile manufacturers in countries in the ASEAN are freely to export cars to Vietnam with a tariff of zero percent. Meanwhile, domestic automobile manufacturers have had to use many tricks to win market share as they wanted to liquidate outdated models and clear their current stocks as well as sell new models. Despite information that registration fees for pickup trucks will be three times higher as of April this year, their prices still decline. For instance, Mitsubishi is offering a discount on pickup trucks. GM Vietnam has also run an appealing promotional campaign for many imported car models since the beginning of this year. Noticeably, automobile market will welcome some new brands and models in the second quarter of this year. In April, Honda Civic 2019 will make debut in Vietnam and is expected to become an archrival of mid-range cars, including Mazda 3, Hyundai Elantra or Kia Cerato. At the same time, VinFast will also deliver its cars to customers in the third and fourth quarters of this year. Of which, its low-cost Fadil model will compete with Kia Morning, Toyota Wigo and Hyundai i10. According to economic experts, along with domestically-assembled cars and cars imported from countries in the ASEAN, the number of cars imported from Germany, Japan and the US has increased since the end of last year, showing positive signs on imported car market. ‘Diversity in model and market segment in automobile market itself will help the quality of cars to become better while the car prices are likely to lower further amid total competition. 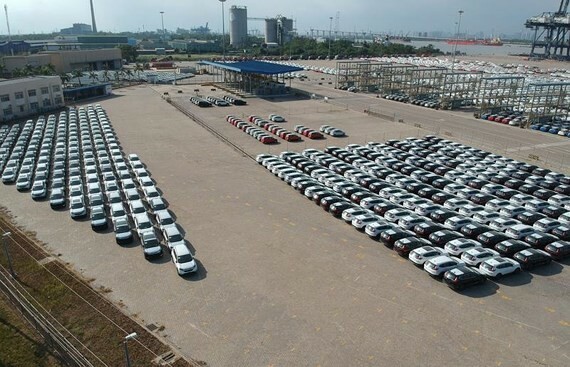 Once automotive market has become more stable in terms of policy as well as there is no entanglement in importing, the Vietnam’s automotive market will see new breakthrough’, said economic expert Tran Minh Ngoc with the Ho Chi Minh City University of Industry. According to Mr. Ngoc, as 90 percent of cars imported from countries in the ASEAN receive an import tariff of zero percent under the free trade agreements along with the EU-Vietnam Free Trade Agreement, purchasing power for luxury cars is expected to be stimulated. Therefore, there will be cutthroat competition on automotive market as completely built unit luxury car supply has been recovering strongly this year. Noticeably, purchasing power is expected to maintain at high level due to a shortage in car supply last year while market demand remains strong. As a result, automobile market is forecasted to face fierce competition this year because without scarcity, car distributors are forced to reduce prices to maintain market share. Amid the situation, consumers are hoping for owning cars at low prices. Meanwhile, the domestic car assemble industry are facing several challenges as competition has become more cutthroat. Currently, some local manufacturers have halted assembly of some car models to switch to import completely built unit cars. Market developments showed that Vietnamese automobile manufacturing needs stronger improvements. Especially, along with policies to support manufacturers and a steady market growth, focusing on developing supporting industry, increasing localization ratio and improving the quality of domestically-made cars will help local automotive manufacturers to reduce their cost prices so as to compete with imported cars, said Mr. Toru Kinoshita, chairman of the Vietnam Automobile Manufacturers’ Association (VAMA). According to VAMA, automobile sales in the past two months hit 46,653 units, up 20.5 percent over the same period last year. Noticeably, consumption of imported cars accounts for an increasing market share. In the first two months of this year, there were 20,169 CBU cars being sold, up 179 percent year-on-year, accounting for 43.2 percent, whereas the number of sold domestically-assembled cars was 26,484 units, down 15.9 percent. Members of VAMA sold 43,242 cars, up 14.4 percent, accounting for 93 percent of market share.